Why not try something a little bit different these Summer holidays? Mushrooms are a fantastic versatile food. I loved Mum's salads growing up because she would always slice up a few button mushrooms and toss them through. I would get into trouble for trying to sneak a few slices as she was trying to cut them up. Not only do they taste great, but they are a fabulous health food - they are low in kilojoules, are fat free, and are a wonderful source of selenium and ergothionene, antioxidants that play a role in immunity. Mushrooms also contain riboflavin, niacin, pantothenic acid, copper and potassium. They are a good source of thiamine, zinc and manganese and contain bioactive phytochemicals some of which are lectins which display anticancer and antiviral properties. 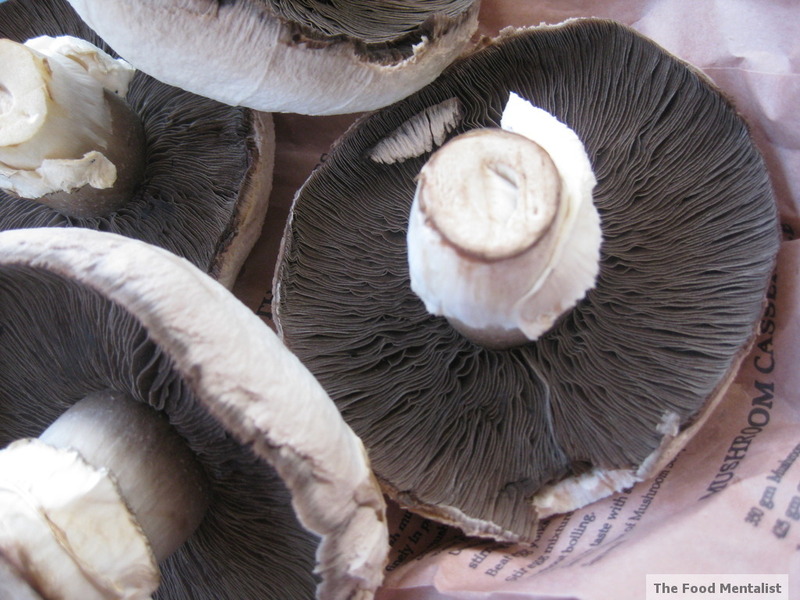 In other words - mushrooms are a wonderful superfood and you should rush out and get some today! I love the fact that mushrooms have such a delicate flavour and for this reason, they are really easy to cook with. They pair so well with many flavours and dishes - think marinated, barbecued, roasted, salads, pastas, but to name a few, they all work! This burger is super easy to prepare, and is perfect for entertaining outdoors during these Summer months. Once you make the patties, you literally just throw it all on the barbecue. The grilled mushrooms and haloumi cheese pair so well with the flavour of the beef patties. Add a dollop of chutney & aoli and you have the best tasting mushroom burger around! Peel red onion and place half into a food processor and pulse until chopped. Add yolk to food processor with breadcrumbs, mustard, oregano, cumin & chilli powder. Add grated cheese and pulse until all ingredients are combined. Transfer to a bowl and add beef mince to the bowl to combine. Season with salt & pepper then using your hands give the mixture a good knead to ensure everything is really well combined. Shape balls of the mixture into 4 evenly sized patties and place on a clean plate or tray, cover and place into the fridge for about 5-10 minutes until they are slightly firm. Meanwhile, heat your barbecue hot plate to a relatively high heat. Lightly oil it also using olive oil or spray. Slice haloumi cheese into even slices about 1/2cm thick. Next, remove beef patties from the fridge and place each one onto the hotplate along with the mushroom cups top side down and sliced haloumi. Season the mushrooms either side with cracked pepper and a little salt. Monitor the patties, mushrooms and sliced haloumi and remove once cooked. Place one mushroom cup on each plate bottom side facing up and assemble burgers as you would normally. 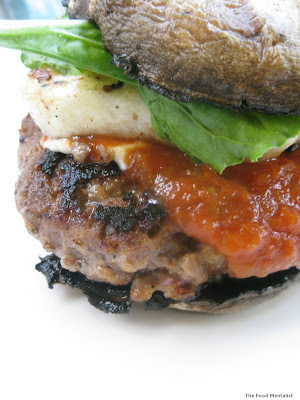 Place a dollop of chutney and aoli on each burger and top with another mushroom cup to finish. * Note - make sure you throw the mushrooms stalks on the barbecue as well, they make a great little snack while you are waiting for the burgers to cook. 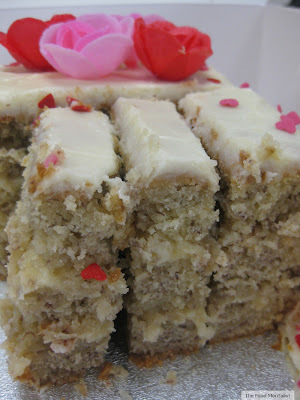 We ate ours using a knife and fork - not sure if you could pick them up as we didn't try. These mushroom burgers are truly delicious. The mushrooms give the burger such a great flavour and what I love is that they leave you feeling satisfied without feeling heavy and weighed down - which often results when we eat burgers with a thick stodgy bread bun. I hope you get a chance to share this delicious summer recipe with your family & friends this summer. Those burgers look great, I love mushrooms too! Mushrooms and haloumi = my lifelong obsession. Love that you've added them to the burgers! wow.. mushrooms as the bun. I've made burgers with mushies as the "meat" before but this looks wonderful! 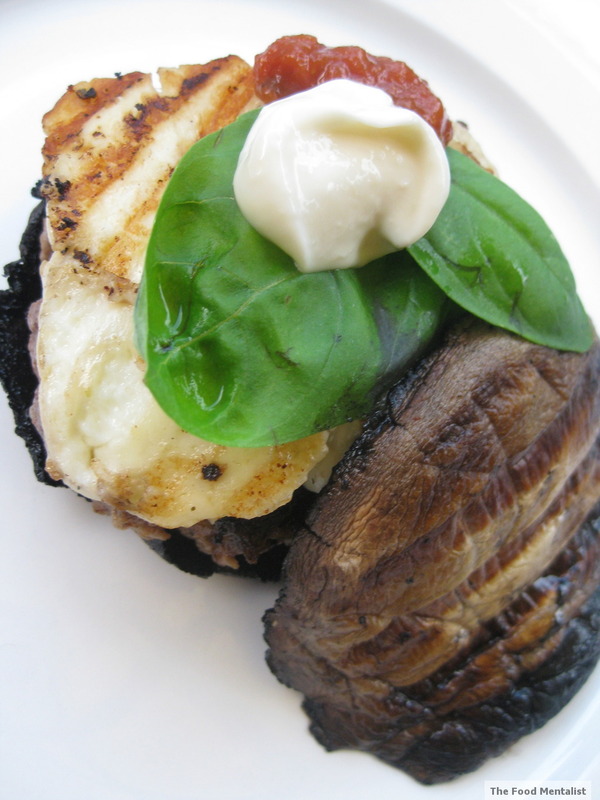 I am loving your idea here....haloumi in a burger WITH mushrooms...YUM!! Mushrooms are a relatively new passion for me, so I would never have thought of using mushrooms like this. Looks beautiful, I'll give it a go!